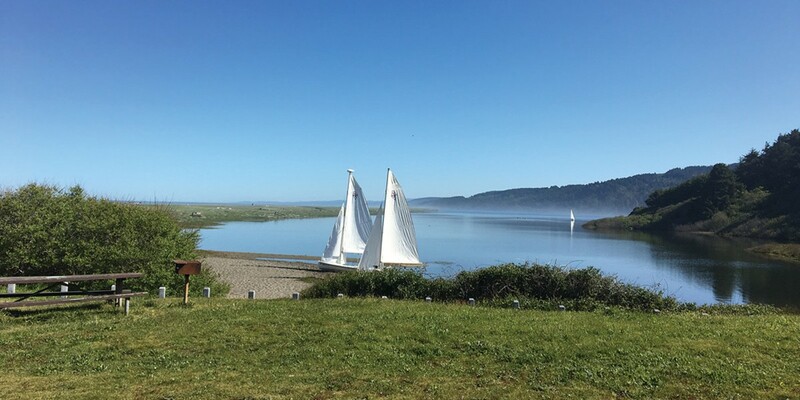 Photo courtesy of Humboldt Bay Aquatic Center Lasers about to set sail on Big Lagoon. Growing up surrounded by fishing families, I regarded the local waterways not as playgrounds but as parts of a great wilderness in which some people risked their lives. 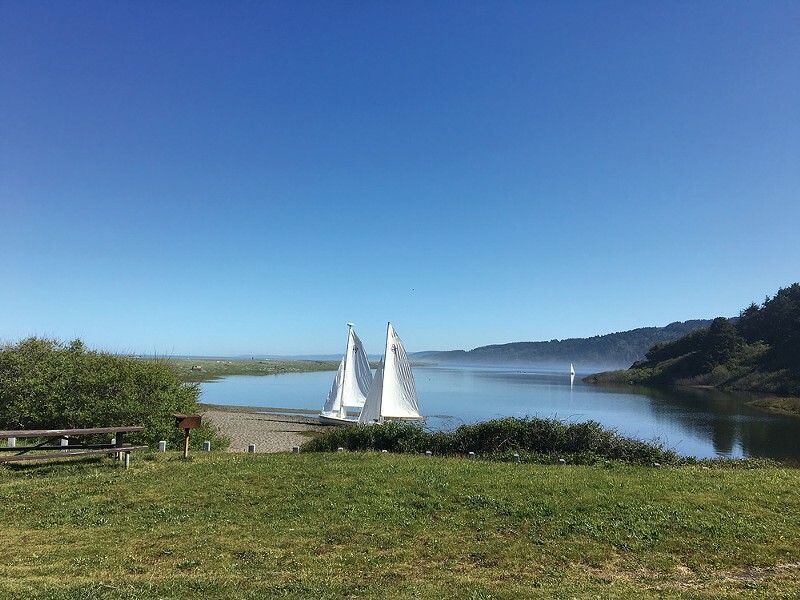 And so I scoffed at the idea of taking a recreational sailing class through Humboldt State University's Center Activities. But my husband is far more adventurous. He believed, now that our youngest child had left for college, that we ought to bond with a sailing class. I suggested a dance class instead but he could not be dissuaded. He got me to the first sailing class by promising that it was both free and on land. The class met one evening at the Humboldt Bay Aquatic Center, where our instructor Anthony Wiese employed the whiteboard to introduce basic theories. I found myself fascinated by the sailing terms, which often had an archaic tone. Heading straight into the wind, for instance, is called being "in irons." Sailors have an alternate name for just about everything: even rope is referred to as "line." As Anthony handed out pieces of line so that we could practice our knots, he told us about the Laser we'd be sailing at Big Lagoon — a 14-foot craft with a single sail, used in Olympic racing. The evening was wearing on and I was getting a bit sleepy when I heard Anthony say, "Everyone wants to panic when they see a Laser capsize, but it really isn't that big of a deal. So let's go over how to right the boat and get yourself going again." Being one of those people who indeed would panic in such a situation, I gave Anthony my full attention. Apparently, if the boat tips over and the sail lies down in the water, one should swim around the stern, pull oneself up onto the centerboard, reach for the edge of the boat and use one's weight to tip it right side up again — hopefully before the sail fills with too much water. Anthony and the other two instructors Eric Hall and Rob Baker had extensive sailing experience and they assured us that they would be alongside instantly to help. Still, this "capsizing" scenario stayed on my mind as we picked out our wetsuits, helmets and lifejackets. It was still on my mind when our class met again, in the early morning mist at the Big Lagoon boat ramp. Our instructors immediately introduced us to our first sailing occupation: carrying gear. There was a lot of that part. Sailors, it turns out, should not be averse to hard work. Then we learned how to rig the boats. My husband, a former Boy Scout, excelled at tying knots and had to re-tie several of my attempts but eventually my Laser was rigged alongside several others. My heart thumped beneath the neoprene of my wetsuit; soon I would be alone in this small boat, sailing. Anthony explained that we would stay near the boat ramp to practice "tacking," which is another word for turning upwind. Once launched, I did my best to maneuver my speedy little craft, which tilted toward its side whenever the 20-foot-high sail caught the breeze. I flew across the water with only the sound of the wind and my own voice singing childhood songs, in attempt to quell my panic. I did manage to tack several times, ducking under the boom and switching to the other side of the craft, adjusting the tiller and trimming the sail — until the boat capsized and spilled me into the water. As promised, my instructors were immediately by my side and I was soon righted. The sail filled with air an like a sleek animal taking a breath, and the Laser sped away again. I rebelled the second day, threatening to sit in the car because there was lightning and dark clouds. The plan was to sail all the way to the far northern end of the lagoon, and I didn't feel ready — even after the clouds cleared up. But Anthony offered to sail with me in the Pico (a sailboat known to be good for beginners) and with a great deal of his help, we arrived at the other end of the lagoon. Once the entire class had made it safely ashore, we turned one of the boats sideways onto the sand and ate lunch in the windbreak formed by the hull. Coming back, we were running with the wind and I was able to point my bow southward, letting the wind carry us all the way home. The exhilaration of that last day convinced me to take the next class, which used 16-foot-long Coronados. This was where the true bonding happened, as my husband and I had to work together on one boat to operate two different sails. Good communication is always important in marriage but even more so when you risk being hit upside the head by a swinging boom. Our sailboat raced alongside the whitecaps, its bow dipping and then leaping out of the swells. As we whirled and sped across the lagoon, I began to see that we had taken a kind of dance class after all. We pushed on the tiller and pulled on the line, crouched under the boom and leaned back into the wind — performing a dance that sent us sailing across the surface of water. If you want to try it, Center Activities has its next Introduction to Sailing class April 8 and 9 ($165, $150 HSU students). Contact staff through the website www.2.humboldt.edu/centeractivities or call 826-3357 to find out more, reserve a spot and learn about the next round of classes and intermediate and advanced classes.